Some artists express industrialism through their choice of subject matter: factories, machines, gears, tools, workers, assembly lines, etc. Other artists explore industrialism through their choice of materials: iron, glass, concrete, coal, tar, repurposed machine parts, factory fittings, rusty steel, etc. 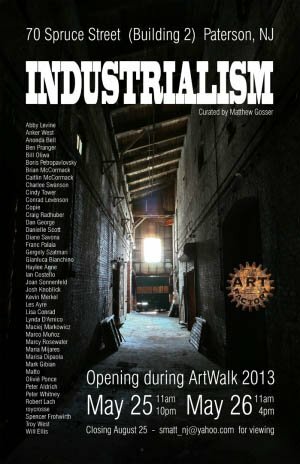 Still other artists delve into industrialism through what could best be described as an industrial aesthetic: dark, gritty, grainy, black + white, raw, stark, steam punk, etc. Combining any or all three of the approaches above further solidifies a piece of art into the realm of industrialism.